Cockroaches are annoying pests that breed rapidly and spread germs. They also cause allergies and respiratory conditions. If you see one cockroach there is a high chance that there are many more lurking close by. Many people prefer not to use harsh and poisonous chemicals and pesticides, so here are some natural ways you can get rid of these pests. The best way to discourage cockroach activity is to make the area uninteresting and unattractive. Make sure you clean up all food crumbs, empty the trash as much as possible and keep as much of your house dry. If you are having severe problems, try to keep any trash out of reach and do your dishes immediately after you use them so cockroaches have nothing to eat. A combination of equal parts of baking soda and sugar can be placed in small containers (such as bottle caps) and left where cockroaches regularly run. Place some water close by. In theory, the cockroaches are attracted to the sugar, eat the baking soda and then, when they drink the water, the mixture causes gas to build in their stomachs and kill them. 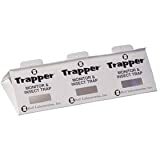 These relatively cheap glue traps catch any bug that slithers past - including cockroaches. You can bait them with any type of food that cockroaches enjoy and watch them catch dozens of pests. Mix equal parts of borax and sugar and smear it in areas where cockroaches are regularly seen. They'll eat the mixture after being attracted to the sugar - and will then die from the effect of borax on their internal organs. This powder, similar to pumice, is a broken down form of fossilized algae. 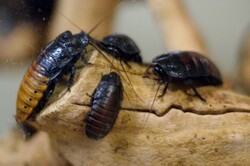 When left around for cockroaches to eat, they begin to dry out their shells and cause them to fall sick and die. Just make sure you don't leave any water near the powder or it won't work. Mix equal parts of cloves and epsom salts and leave the mixture in areas that cockroaches regularly frequent. Cockroaches like neither product so will avoid places where they find this mixture. Crush some fresh bayleaves or catnip and leave it in corners where you've seen cockroaches. They hate the smell and taste so they'll be on their way out in no time. Not only does clove oil relieve tooth ache - it also keeps cockroaches at bay! Pour some in corners and dark niches where cockroaches like to hide and they'll be disappearing faster than the road runner. Punch the lid of a jar so cockroaches will fall in, but won't be able to escape again. Put chocolate or coffee grounds in the jar to attract the cockroaches. These leaves (when crushed) irritate a cockroach's respiratory and nervous system when inhaled. Pandan leaves are native to Thailand and grow on the Pandanus palm but are also available in other countries. Cockroaches love dark and dirty places. Make sure you clean regularly behind furniture and don't eat in areas that won't be regularly cleaned or where crumbs could fall behind things. A neat house is less likely to have a thriving cockroach colony. Older houses often have cracks - in walls, floors and plenty of other places. Other areas that may need sealing are outside drainage pipes that lead directly inside. Seal these up to keep cockroaches out. I've just moved to where there are cockroaches. Time to try out some of these solutions. Thanks. Have you ever been to Cyprus? The Cypriot cockroaches FLY! That's very FUNNY, but they are still very UGLY and they don't mind buzzing around you like lopsided hovercrafts when you're sitting outside. Revolting! I'm always a believer in using natural solutions so enjoyed your page. Gave you a Wizz vote too. I like your natural solutions. We don't have cockroaches here, though we have other pests!